Herb Sutter blogged about the Oulo ISO C++ meeting. There’s a link to an interview he did for the excellent CppCast podcast and also to a reddit post on features approved at the meeting. This is interesting because I’ve been using the std::tie syntax for a while, despite the clumsiness when you need to introduce new variables to take the return types (leaving them uninitialised until assignment). The proposal above avoids that problem. This proposal makes if/switch more consistent with for loops that allow separate initialisation/increment clauses as well as a condition. So now you can initialise a variable separately from the if condition, which also allows you to limit the scope of that variable. 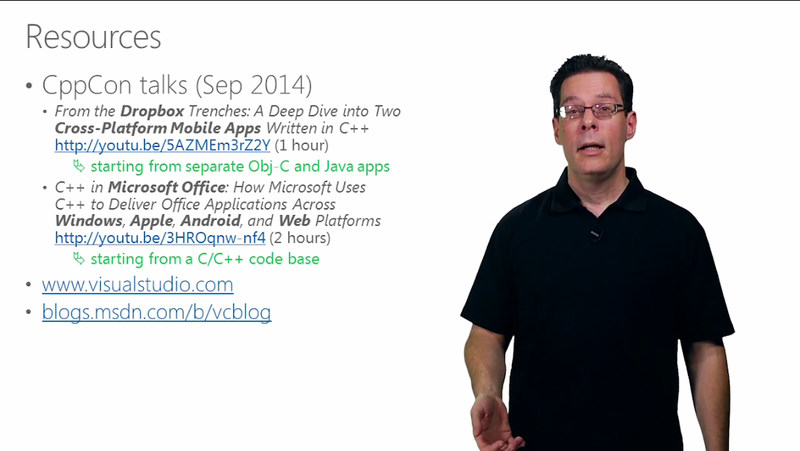 Herb Sutter’s Back to the Basics video is hardly an introduction to C++ as the name suggests. 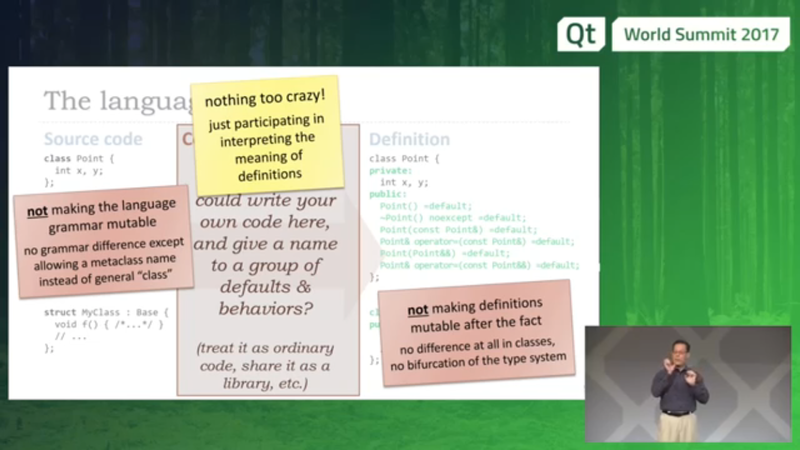 Rather, it clarifies his default choices when faced with some basic tasks like parameter passing, in the light of modern C++ techniques. Don’t pass owning choices down the call stack – use non-owning raw pointers and references when you don’t need ownership transfer down the call stack, e.g. when callee parameter’s lifetime entirely nested within the called method. 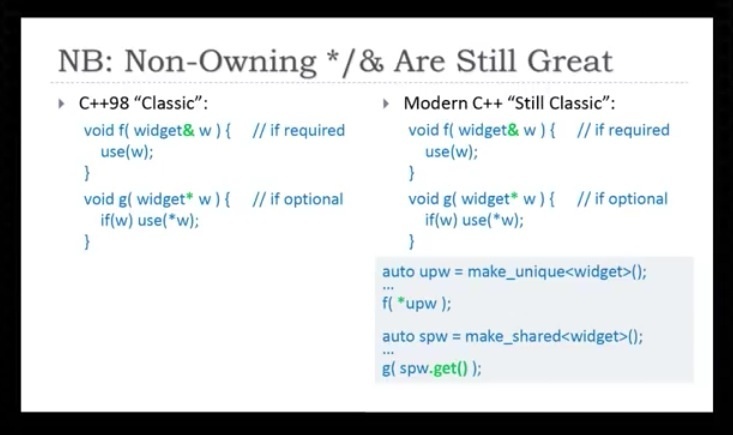 If the called method doesn’t participate in ownership, it should be agnostic to the lifetime of the object, whether on the stack, the heap, global, shared_ptr or unique_ptr. 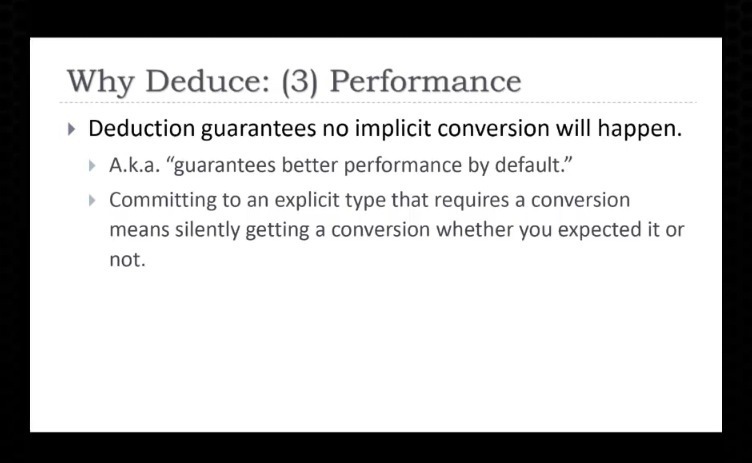 Another reason to use auto is performance – it guarantees no implicit conversion because there’s no explicit declared type. Reviewing parameter passing choices, established rules of thumb still apply, they just got better. This is especially true for pass-by-value, which experts considered to be the new default choice for a while for moveable types, but is now only recommended for constructors that wish to retain a copy. 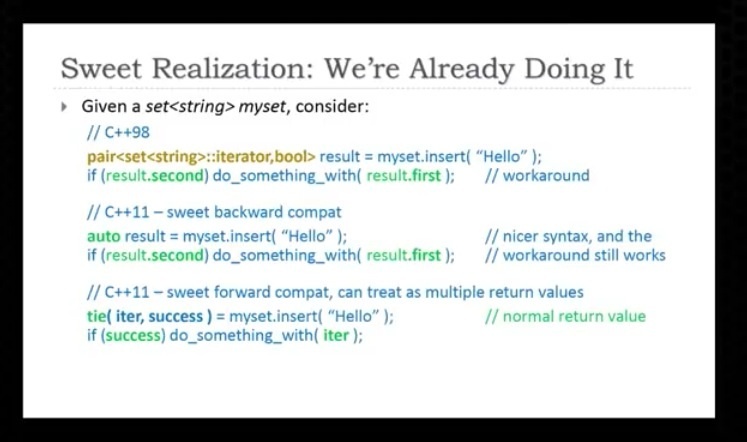 There was a bonus slide on returning multiple values using std::tie, which I’ve been doing for a while. Finally, it seems that there’s a new term for Universal References – “Forwarding References”. 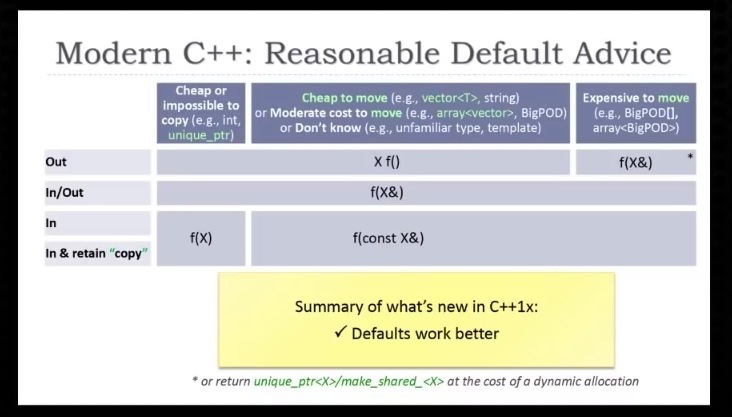 I agree that this states the intention of T&& parameters better that Scott Meyer’s original name, although my eBook of Effective Modern C++ still uses the old name. 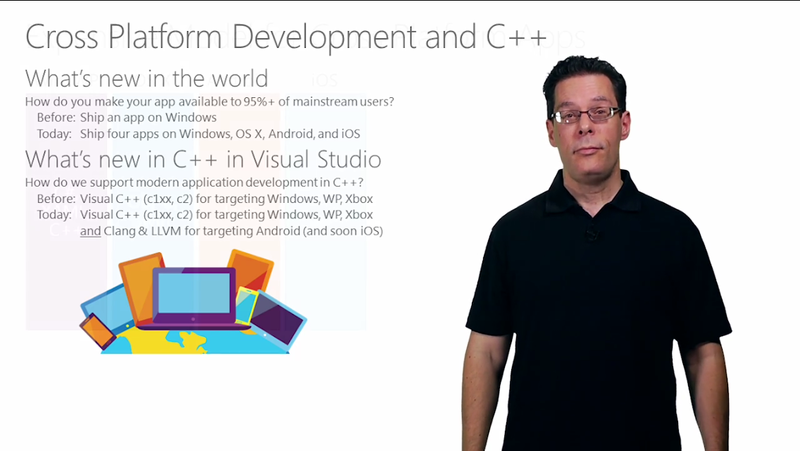 Exciting times for C++, you can now target multiple compilers and platforms from a single IDE, Visual Studio. Herb Sutter’s Guru of the Week article on Almost Always Auto is a tour de force covering everything you always wanted to know about auto. Passing a shared_ptr by value implies taking shared ownership. A copy is needed anyway, so incurring copying cost is fine. Don’t use a const smart_ptr& parameter because it exposes the function to the caller’s lifetime management policy. Use a Widget* instead. Guideline: Don’t pass a smart pointer as a function parameter unless you want to use or manipulate the smart pointer itself, such as to share or transfer ownership. 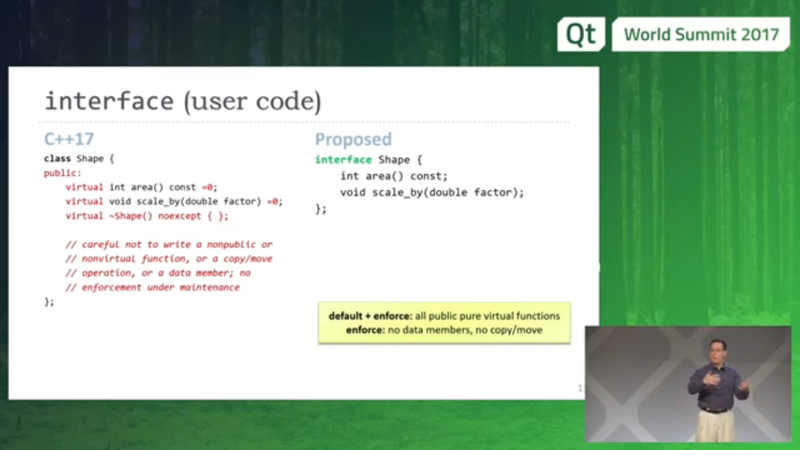 If you use make_shared to allocate the object and the shared_ptr all in one go, then the implementation can fold them together in a single allocation.